Eric Dunning Sensei (5 Dan, ZNIR) will soon be opening a new Dojo on Monday, Wednesday, and Friday nights from 6:30PM to 8:30PM at 100 Mile House in the 100 Mile House Elementary main Gymnasium, starting October 15, 2018. We look forward to meeting new practitioners! Itoh Sensei visited 100 Mile House and gave Eric Sensei private Iaido lessons to help further prepare him for the upcoming Dojo opening. We are very grateful to Itoh Sensei for the knowledge and teachings he has provided for the CIA. 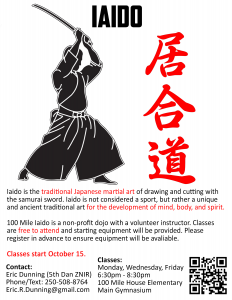 We also thank Eric Sensei for his enthusiasm to help spreading Iaido in Canada. The CIA looks forward to seeing new promising Iaido practitioners appearing from 100 Mile House in the near future.